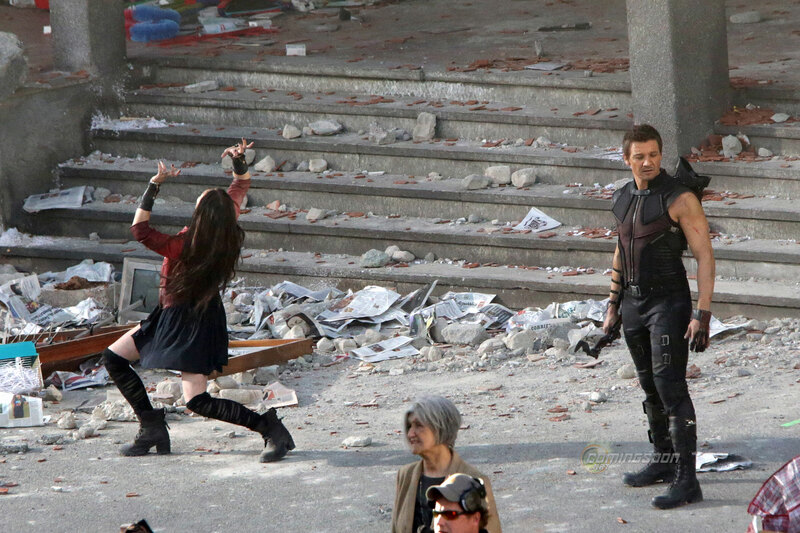 New Set Photos From Avengers: Age of Ultron Reveal Quicksilver, Scarlet Witch and More! Production is clearly in full swing on the Italian set of Avengers: Age of Ultron with a massive action piece lensing today. We've got a set of photos from the production, showing off a battle that includes Jeremy Renner's Hawkeye, Elizabeth Olsen's Scarlet Witch, Aaron Taylor-Johnson's Quicksilver and, it appears, even Ultron himself (along with a number of mysterious motion capture actors, too)! Check out all the images in the gallery viewer below! Also starring Robert Downey Jr., Chris Hemsworth, Mark Ruffalo, Chris Evans, Scarlett Johansson, Samuel L. Jackson, Thomas Kretschmann and James Spader, the Joss Whedon-directed Avengers: Age of Ultron will hit theaters on May 1, 2015.